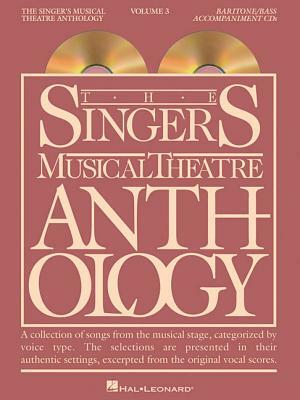 The Singer's Musical Theatre Anthology - Volume 3 (Other) | The Drama Book Shop, Inc.
(Vocal Collection). Two accompaniment CDs in each package which match the books containing a collection of songs from the musical stage, categorized by voice type. The selections are presented in their authentic settings, excerpted from the original vocal scores. Contents: BEAUTY AND THE BEAST: Gaston, Me, If I Can't Love Her * CABARET: Don't Go * CHICAGO: All I Care About * CLOSER THAN EVER: If I Sing * THE FIREBRAND OF FLORENECE: A Rhyme for Angela * FOOTLOOSE: I Confess * GIGI: Gigi * THE HAPPY TIME: I Don't Remember You * I LOVE YOU, YOU'RE PERFECT, NOW CHANGE: The Baby Song * IS THERE LIFE AFTER HIGH SCHOOL? : The Kid Inside * JACQUES BREL IS ALIVE AND WELL AND LIVING IN PARIS: The Bulls, Funeral Tango * JEKYLL & HYDE: Lost in the Darkness * THE LITTLE MERMAID (film): Les Poissons * MARRY ME A LITTLE: Happily Ever After * MARTIN GUERRE: Justice Will Be Done * THE MIKADO: As Some Day It May Happen * MINNIE'S BOYS: Mama, A Rainbow, Where Was I When They Passed Out the Luck? * THE MUSIC MAN: The Sadder But Wiser Girl * NEWSIES (film): Santa Fe * ON A CLEAR DAY YOU CAN SEE FOREVER: Come Back to Me, On a Clear Day (You Can See Forever) * ON THE TOWN: Lucky to Be Me * PARADE: It's Hard to Speak My Heart * RUTHLESS: I Hate Musicals * SATURDAY NIGHT: Isn't It? * SIDE SHOW: You Should Be Loved, Private Conversation, The Devil You Know * SMILE: Smile * STOP THE WORLD-I WANT TO GET OFF: What Kind of Fool Am I? * SUNSET BOULEVARD: The Greatest Star of All * TITANIC: In Every Age, There She Is * VICTOR/VICTORIA: King's Dilemma, Paris by Night * WHEN PIGS FLY: Sam and Me, Laughing Matters * WHOOP DEE DOO : Last One Picked.